Every problem can be fixed with a solution. But when your problem is keeping you from getting a good night’s rest, like snoring, for example, then you better have an excellent solution for that pronto. An anti snoring pillow is only one of the many snoring solutions available in the market which can help you get your much deserved rest. It is a ready-made solution for preventing snoring or mild sleep apnea. By using an anti snoring pillow, your head will be positioned to a certain level where it becomes more aligned with the airway thus clearing any obstructions and preventing snoring. Out of the many anti snoring pillows out there today, you will need to choose carefully for you to be able to find the one that suits you best. To do that, you have to know the uniqueness that each pillow has from another. Compare each product from the other to know which pillow may work for you the best. If you like simplicity, then this pillow is perfect for you. 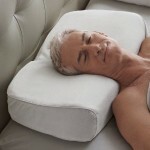 This pillow may look plain but it can do a lot more than just to provide support for the head and neck. The whole pillow also follows the contours of your body to keep it well-supported, thus reducing your snoring to a considerable amount. The pillow is also more affordable as compared to most of the other anti snore pillows. What makes the Brookstone Anti-Snore Pillow unique is that it prevents you from snoring without needing you to change your sleeping position. This is a good recommendation for people who are used to sleeping flat on their backs. 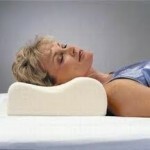 It has a special contour shape so that the head and neck are supported by the pillow and the chin is pointed outwards. This position keeps the airway clear from any obstruction, thus making it easier for you to breathe during sleep. If you’re used to sleeping on your side, this pillow can also work for you. Its design keeps your head and neck supported so it doesn’t matter if you change your sleeping position during the night. Also to keep your pillow irritant-free, the pillow cover is entirely removable and washable. It’s also a standard-sized pillow so it can fit into most of your pillow cases. Is your snoring problem becoming a big bother? Start your way to a comfortable sleep with the help of an anti snore pillow. This pillow by Contour allows you to control the height of your pillow with its unique adjustable air chambers and easy to use inflate valves. The fact that this pillow is adjustable in height makes it easier for you to feel comfortable to a new sleeping position. 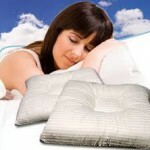 For added comfort, this pillow is provided with soft cotton covers which can also be removed and washed for cleaning. What’s even more impressive with this product is that it comes with a five-year guarantee to reassure users that they can expect the kind of quality that’s worth their money. This pillow works very uniquely and effectively because it vibrates to tell the user when he or she has changed to a position that does not reduce snoring. Aside from having a design to support the head and neck, this sensor-equipped pillow also makes sure that you remain sleeping in that position all throughout the night. The vibration feature can be adjusted in various volumes to best suit both light and heavy sleepers. 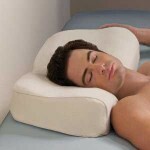 Here’s a uniquely designed pillow that promises to place your head and neck at an optimal position. The SONA Anti-Snore and Mild Sleep Apnea Pillow will keep you sleeping on your side because of its shape and firm material. It’s made with SofLoft fiber so it doesn’t lose its shape even with the weight of your head. The pillow is also compact-sized, allowing users to bring this pillow with them when they travel. Comfort and snore-free sleeps can be brought with you anytime, anywhere, with the SONA anti-snore and mild sleep apnea pillow. All these products can be viewed from shopping websites for prices. It’s also helpful to read on consumer reviews to know what kind of results other users are getting from a product.